After Dalvin Cook dropped a pitch from Kirk Cousins and A'Shawn Robinson recovered at the Detroit 28 with Minnesota leading 17-6, the Lions had a chance to catch up. They converted a fake punt to keep the drive alive. Two plays later, Stafford ran right on the short side of the field and tried a dangerous flip to Kerryon Johnson. The ball fluttered to the turf, and Hunter scooped it up on his way to the easy score. Cook gave the Vikings a boost with 89 yards on 10 carries after missing five of the last six games with a hamstring injury. Adam Thielen's streak of 100-yard receiving games ended at eight in a row, leaving him in a tie for the record with Lions legend Calvin Johnson, but he caught a touchdown pass for the sixth straight game to help Kirk Cousins navigate the absence of fellow standout Stefon Diggs. The opening kickoff was ominous for the Lions when Matt Prater slipped, an unintentional squib the Vikings returned to their 35. With Diggs sidelined by a rib injury, practice squad promotion Chad Beebe caught back-to-back passes on the first drive of his NFL debut. The second one netted 13 yards on fourth-and-2 from the Detroit 37. Latavius Murray finished the march with a 1-yard touchdown run. The Vikings have shown more vulnerability against the pass than last season when they led the league in total defense, but on third downs they've been just as dominant. Sheldon Richardson and Tom Johnson split a sack of Stafford on third-and-goal early in the second quarter to force the first of three field goals by Prater. After Cousins made his biggest mistake of the game, a high throw to Thielen near midfield that Darius Slay left his man to intercept, the Lions made it as far as the 12-yard line. 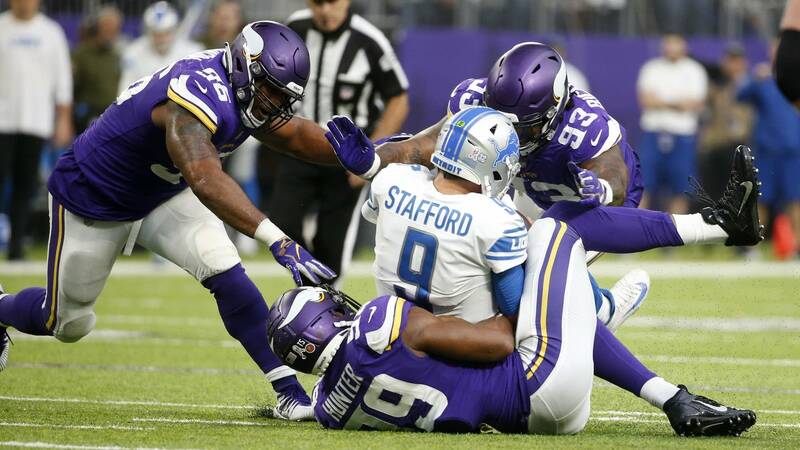 Hunter sacked Stafford on consecutive snaps, sharing the first one with Everson Griffen and using the second one to bring Prater out for another kick. Then on the next play for the Vikings, with one burst through a big hole in the left side of the line, Cook made clear he's healthy again with a 70-yard gain. He lost his balance at the 5 after being tripped up by Glover Quin. Thielen scored two snaps later with a slick corner-post move that left Nevin Lawson in his wake for a 14-6 lead. The previous high sack total for Stafford in his career was seven, against the Vikings in 2015. Minnesota had nine sacks in a game four times prior to this, but the most recent was in 1993.